Christmas Album issue | Rock Hill Cafe to close. 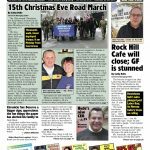 15th Christmas Eve Road March. Conover vs. Beatty. Hyde’s new CEO. Sam’s Diner raises $37,500 for Operation Santa. 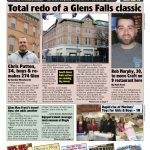 Glens Falls ‘Pocket Park’ plan. GF also gets $1.5 million grant for South Street parking garage. 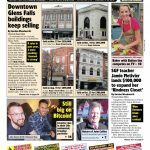 Warren County’s plastic bag plan ‘tweaked’. Adirondack Thunder Teddy Bear Toss. Concerts, comedy, shows… The Chronicle always has the region’s best Arts & Entertainment section! 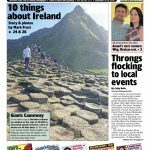 Holiday Helping issue | 10 things about Ireland. Ash Anand expands in Warrensburg. Local events are drawing throngs! 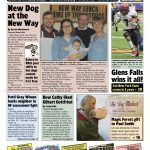 North Country Orthopedics joins Glens Falls Hospital. TD Bank building sold. St. Mary’s Academy Class of 1968 Reunion. Granville Lions donate food pantry building. So many holiday events! Pages of real estate listings… Find your dream home! Concerts, comedy, shows… The Chronicle always has the region’s best Arts & Entertainment section!